The Welch Boys had a new album a few months ago. I’m just now getting around to reviewing it. I’m sure glad I don’t have somebody breathing down make neck about deadlines. Drinkin’ Angry is 18 tracks of blue collar anthems and street punk grit. 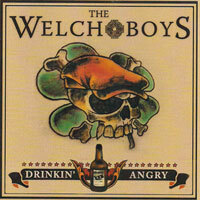 Like their Boston brothers the Dropkick Murphys, The Welch Boys bring it to ya wit the credible sounds of hard livin’ and songs that are about real life and a whole lot about drinkin’. Raw rockin’ punk with a sing-a-long quality that is hard to resist.